The new Baccarat Boutique, BBar, Lounge located in Milan, Italy. Alexandre Benjamin Navet illustrating his designs on the walls of the Baccarat Boutique, BBar, Lounge in Milan, Italy. Before and after presentation of the creation of the Baccarat Boutique, BBar, Lounge in Milan, Italy. An empty room transformed into a beautiful Baccarat Boutique, BBar, Lounge with Baccarat chandeliers and tables and chairs. Staff greets guests with champagne at the grand opening celebration of the Baccarat Boutique, BBar and Lounge in the courtyard of Via Montenapoleone. Guests enjoy a first look at the Baccarat Boutique, BBar, Lounge taking photographs and celebrating with champagne. View of the sky from the new Baccarat Boutique, Bbar, Lounge courtyard with Baccarat logotype. 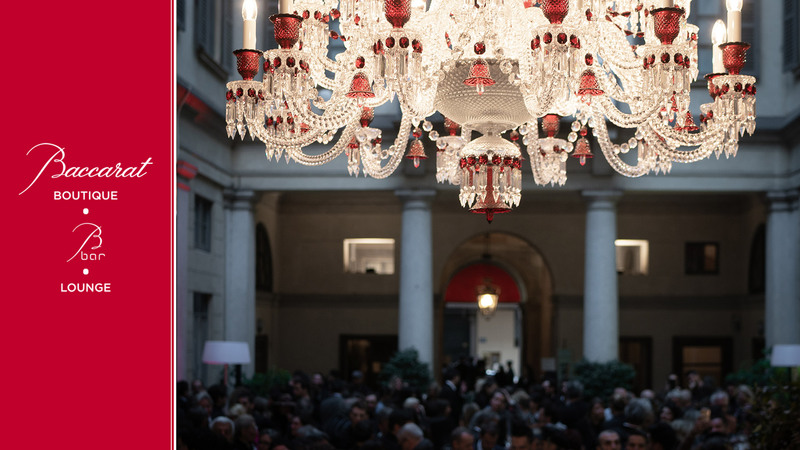 Inspired by the success of the Baccarat bar & lounge of the eponymous hotel in New York, the world premiere Baccarat Boutique, BBar, Lounge opens in Milan, in a beautiful courtyard in Via Montenapoleone. Unique in its kind, the location presents a glamorous mix of heritage and modernity and it’s decorated with Baccarat crystals, superb collections of glasses, vintage cutlery and teapots, fabrics and colors of the most beloved Milan, also featuring paintings by Alexandre Benjamin Navet that recall the frescoes of the building. An exclusive place, ideal for a coffee, a business lunch, a juicy break while shopping, a glass of champagne or a signature Baccarat cocktail before dinner. Along the bar and lounge menu is the "art de la table" offer in the adjacent boutique, to treat yourself or to get a gift in a magical red box containing everything you liked about this wonderful, not to be missed cocoon.